As we enter the holiday week-end, Leon Kass provides a terrific tribute to America in the Wall Street Journal using a famous speech by Calvin Coolidge. His words ring true as if they were delivered yesterday rather than 85 years ago. History is replete with the births (and deaths) of nations. But the birth of the United States was unique because it was, and remains, a nation founded not on ties of blood, soil or ethnicity, but on ideas, held as self-evident truths: that all men are created equal; they are endowed with certain inalienable rights; and, therefore, the just powers of government, devised to safeguard those rights, must be derived from the consent of the governed. What is the source of these ideas, and their singular combination in the Declaration? Many have credited European thinkers, both British and French. 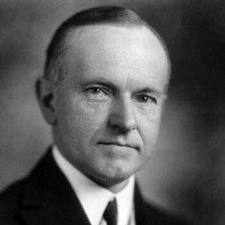 Coolidge, citing 17th- and 18th-century sermons and writings of colonial clergy, provides ample evidence that the principles of the Declaration, and especially equality, are of American cultural and religious provenance: “They preached equality because they believed in the fatherhood of God and the brotherhood of man. They justified freedom by the text that we are all created in the divine image, all partakers of the divine spirit.” From this teaching flowed the emerging American rejection of monarchy and our bold embrace of democratic self-government. He also observes that the Declaration’s principles are final, not to be discarded in the name of progress. To deny the truth of human equality, or inalienable rights, or government by consent is not to go forward but backward—away from self-government, from individual rights, from the belief in the equal dignity of every human being.